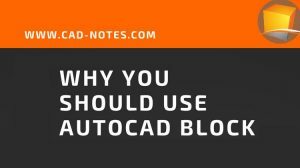 AutoCAD template is an important feature to give you a head start. We listed template in our ten features to boost your productivity infographic here. However, we must consider not adding too many unnecessary objects to our template. 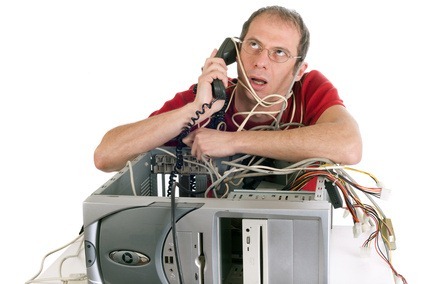 Sometimes it is hard to determine when you have different sets of standards. In this situation, it can be better to keep the template at the minimum, and we can use other ways to keep our standards. We will cover it in several articles, how you can add objects and styles quickly to a drawing. In this first article, we cover about using Tool Palettes. Tool Palettes is similar to using tools in the Ribbon. You can click it to activate the tool. The advantage of Tool Palette is, you can customize the properties easily. 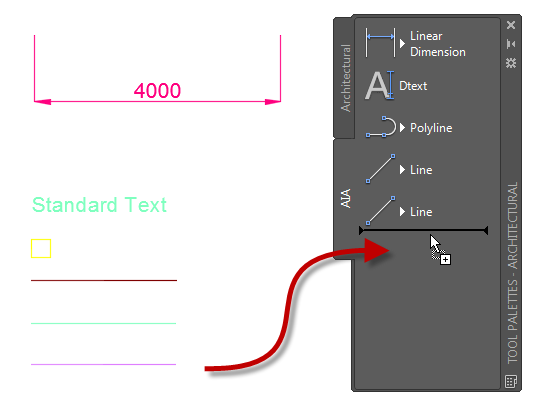 You can make a tool to create a line on layer A-COLS without changing the active layer. Even if the layer doesn’t exist in your drawing, the tool will create one for you with the correct properties. You can add a tool to make hatch with a particular type, size, and layer. You can create a dimension with a particular layer and style. It means that you don’t have to add the layers and styles in your template. You can keep the template simple. The best thing about the Tool Palette is you don’t need to have programming knowledge! Let’s start working with the Tool Palettes. Adding objects to Tool Palette is easy. But before we start adding tools to our Palette, let’s create a new Palette. 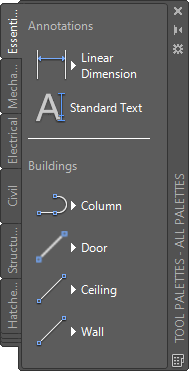 Right click on a Palette tab, and choose New Palette on the context menu. 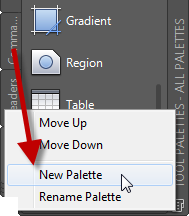 Type the Palette Name then press Enter. In this example, I name it Essentials. Now we have an empty Palette for our tools. To add a tool to a Palette is very easy. All you need is to select an object until it’s highlighted, then drag and drop the object to the Tool Palette. You can open a completed drawing, drag and drop objects that you want to use in the future to your Palette. You can add the standards to your palette easily! You can add blocks to the Tool Palette with drag and drop as well. However, the tool in the Tool Palette doesn’t store the block definition. It will insert the block from the original file. If you lost the original file, the tool won’t work. You need to create a file as a block library. Insert the block definition to this file then save this file in your library folder. Then drag and drop the block to your Palette. 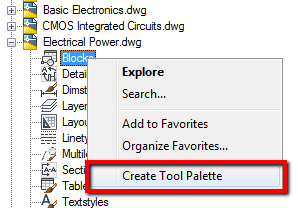 If your DWG contains blocks in a similar category, you can create a Tool Palette from that file quickly. Read this article how you can do it with Design Center. You may need to create more Palettes for different categories and add all tools that you need. When you have many tools in your Palette, you need to customize the tools to find necessary tool quickly. 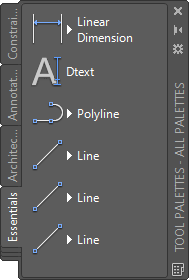 When you drag lines to the Palette, their name and color are the same for all lines. Regardless the line appearance in your drawing. In this example below, it’s difficult to find the correct line to use. Let’s see how you can customize the tools. Renaming the tool is the most basic customization to do. 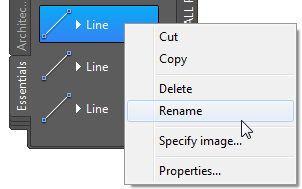 Right click on the tool and click Rename from the context menu. Notice that you can change the tool image too. When you click the small arrow near the tool name, you see a flyout. You can choose the object type to draw from the flyout. 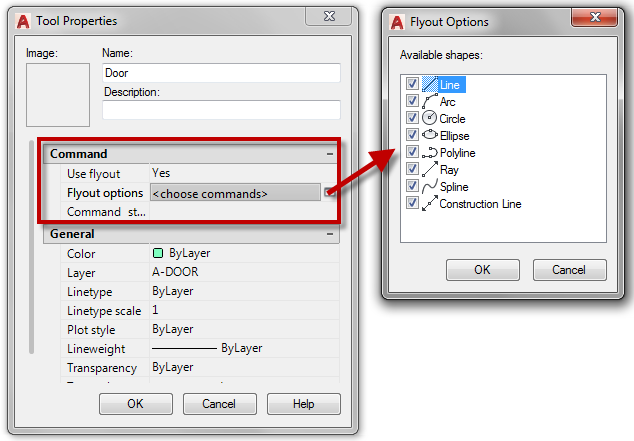 It means you only need one tool to create lines, arc, or polylines. However, you can disable flyout or customize available tools. Right click on the tool and click Properties from the context menu. You can disable flyout by changing Use flyout to No. Click the button next to the Flyout options to choose the tools to show in the flyout. You can also change the tool name from the tool’s Properties. You can modify the tool properties to suit your need further. Depends on the tool, there are various properties that you can change. For example, you can set a dynamic block default states when you insert it from Tool Palettes. You can use a macro in the tool palette. It allows you to create custom commands if you want to get more advanced. Yes, you can use the ribbon or the toolbar for macro too. However, Tool Palettes can be more convenient. After you have all the tools and the palettes, let’s see how you can arrange the palette to allow you find tools easier. You can add text and separator to group tools by their similarities. As you can see in this example, separating the tools can make it easier to find. You can have dozens of Palettes to keep your tools. It is easier to group the palettes for a similar task. When you select a group, you only see the palettes in that group. In below example, Annotation and Design group will show annotation, architectural, mechanical, hatches and fills, electrical, civil, and structural palette. You can drag and drop the palette in the customize palette dialog box. And you can choose a group by clicking the palette title (not the tab). Customization is a big advantage of AutoCAD. 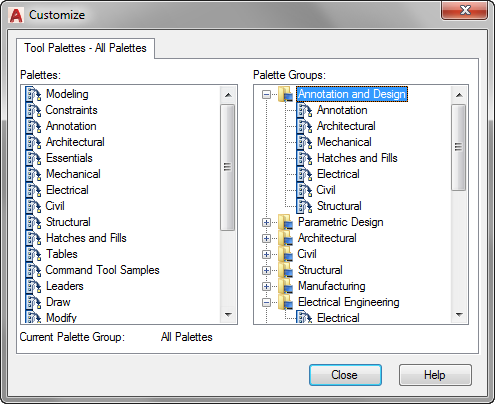 There are many ways to customize AutoCAD, and Tool Palette can be the easiest customization. It can be as easy as you want, or it can be as complex as you can develop it. By optimizing Tool Palettes, you can prevent your template from becoming unnecessarily complex. It can help the drawing grows as you go. We will cover more techniques to develop your drawing without putting too much work in your template. Thanks, Edwin for the great tips. 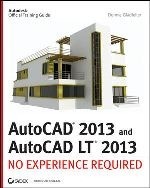 It is very amazing to know how powerful AutoCAD is.